This what your Caruse Blog Blog Ad will look like to visitors! Of course you will want to use keywords and ad targeting to get the most out of your ad campaign! So purchase an ad space today before there all gone! Many people around the world are enticed with owning a black car. After silver and white, it is considered among the most luxurious The post Common Problems of Black Car Owners appeared first on Carused.jp Blog. Many people around the world are enticed with owning a black car. After silver and white, it is considered among the most luxurious colors for vehicles. This hue is often associated with ambition, power, and wealth. This is also the reason why most limousines and Rolls-Royce cars are black. Auto manufacturers even take advantage of the demand by introducing special ‘night’ and ‘black’ editions of their car models. Due to their popularity, it has become common to find black vehicles in any Japanese used car auction. While black cars are menacing and seductively mysterious, they can require high maintenance. So, are you ready to own one? Before you join a Japanese used car auction, make sure you get some useful information from this article first! Some paint colors tend to attract grime and dirt easily, and black is among them. Usually, the dirt won’t be bothersome if it is also black. However, if the stain is caused by mud or rain, they are easily noticeable on the car’s panels. There is no research study proving that black cars are more susceptible to swirl marks than other vehicle colors. However, evidently, the marks stick out more on black cars. Who would want to have unsightly swirls and lines on their car paint? It can be difficult to maintain the luxurious look of a black car since the paint fades faster under sun exposure. Of course, it is virtually impossible to stay out of the sun just to keep the paint in good condition. So, whenever you’re out in the day and you need to park your black car, you always need to find a shady or enclosed spot. Have you ever tried walking out under the sun wearing black from head to toe? Did you notice how sweatier you are? Well, you should know that black attracts heat more than any other color, and the same is true with cars. So, whether you park outdoors or in a garage under the summer heat, you can expect to enter a toasty oven when you open your vehicle’s door. You may be surprised to discover that black cars are prone to accidents. Well, a research study from the Monash University concluded that black vehicles are 12% more likely to get into a collision than white vehicles. When driven in the nighttime, the probability is increased to 47% due to poor visibility. It is true that owning a black car can take serious commitment. However, your effort and financial investment usually pay off. For one, you can have a shiny, well-detailed vehicle that looks dramatically stunning. When properly maintained, black cars can look flawless and immaculate. After all, the creases, curves, and contours are generally more visible in this color. Just look at black superminis and supercars from a Japanese used car auction. All of them look awesome. It is also worth noting that black is a popular color option for used cars. Since there is a high demand for black vehicles, you can expect them to have an excellent resale value. Let’s face it. Black vehicles can be expensive. However, it does not mean that you should forget about your dream of owning one. 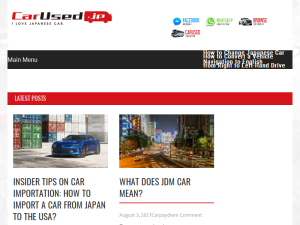 Here at Carused.jp, we can help you get a black car at a fraction of the cost! Just use our online auction tool and let us bid on the vehicle you want. The post Common Problems of Black Car Owners appeared first on Carused.jp Blog. Whether you got your vehicle from a dealership or a used car auction, ergonomics and comfort are crucial to the safety of your The post Easy-to-Follow Steps for Moving a Power Seat Manually appeared first on Carused.jp Blog. Whether you got your vehicle from a dealership or a used car auction, ergonomics and comfort are crucial to the safety of your drives. You should be able to move your seat to the direction you want to ensure that you won’t feel any hassle while you’re behind the wheel. When you are sitting conveniently, you will be able to maneuver your car well. On the other hand, if the driving seat’s space is awkward or too cramped, you will not be able to step on the pedals with ease. Eventually, your chair will annoy you, making your driving experience quite frustrating. These days, modern vehicles—including those from a used car auction—come with power seats. This technology allows you to redirect your chair’s placement, allowing you to maximize your hand-and-feet coordination. While this feature is beneficial and practical, it will fail eventually. Various problems can cause this, including a faulty switch or a damaged unit. If you want to exercise your DIY skills to be able to move your power seat manually, you can consult this article. Our easy-to-follow tips are applicable for most types of vehicles, including a BMW, Mercedes Benz or a Toyota! To be able to free the cable from the motor, you need to unscrew some portions of its housing. Remember that you need to remove the screws to be able to determine what you need to fix inside. Once you’ve removed the screws, keep them in a safe storage place. When you look inside the conduit (plastic) or tube, you will see the woven propeller. This component drives the motor, so it is essential that you check the condition of the wiring connections. To ensure that the seat motor will work, you need to attach one of the sides before the drill and motor. Do not forget to mount it securely, making sure that it functions perfectly. Remember to attach the sides one by one, allowing one seat motor to move at a time. Make sure you find the right pair of connection to avoid risking your safety. Keep in mind that trying to arrange the wires without looking into or studying the wire diagram can be hazardous for you. Once you’ve properly connected the lines, you will be able to move your power seat manually with ease. These steps are the ideal option for fixing a faulty seat motor. As long as the motor is connected to the power correctly, you will be able to move your power seat to your desired position. Now, you will have the peace of mind knowing that you can drive comfortably and safely. On the other hand, if you want an easier way to fix your malfunctioning power seat, we still recommend that you hire an expert mechanic. You can drive your BMW, Mercedes Benz or any type of car to the nearest service center. A qualified technician should be able to fix the issue right to its core. In this way, you will be able to move your power seat to any direction you wish. Moreover, you won’t experience the same problem in the near future. Do you want to learn more car maintenance tips? Make sure you check out our blog posts to get more information on prolonging the life of your vehicle! On the other hand, if you want to get insider tips on finding your dream car through a used car auction, do not hesitate to contact Carused.jp today! The post Easy-to-Follow Steps for Moving a Power Seat Manually appeared first on Carused.jp Blog. What’s amazing about technology is that there’s always a possibility of designing something better. When it comes to the automotive industry, engineers are always working hard to develop something more efficient, more cost-effective, and more environment-friendly. Let’s take the internal combustion engine as an example. You may be amazed how a liquid-powered machine can hurl you through highways at incredible speeds. However, it is always possible to develop an engine that will use less fuel while going faster and further. One of the ways to improve the performance of an engine is by using a turbocharger. It can draw the waste exhaust power from the back of the engine to bring it to the front to deliver that extra ‘oomph’ to your horsepower. You may have come across turbochargers when you read about JDM cars and other vehicles for rally racing. You may wonder how they work. Well, in this post, we will discuss all the essential facts you need to know about turbochargers. Make sure you read through this article to know if using one is suitable for your lifestyle! Have you ever seen vehicles speeding through roads with sooty fumes coming out of their tailpipes? Obviously, their exhaust smoke causes tremendous air pollution. However, it is less apparent that they are also wasting energy. The hot gases pumping out quickly and all the energy it contains make up the exhaust fumes. This wasted power simply disappears uselessly into the atmosphere. Now, imagine harnessing that wasted energy to improve the performance of your car. Well, you can use a turbocharger to achieve that. Engines burn fuel in cylinders to generate power. As air enters each cylinder, it mixes with fuel and ignites to drive a piston out. Consequently, this motion turns the gears and shafts that spin the wheels of a car. As the piston pushes back, it pumps the discarded fuel and air mixture out of the cylinder as exhaust fumes. It is worth noting that how fast a car burns fuel directly affects the amount of power it can generate. So, the bigger the cylinders are and the more you have in your engine, the more fuel your car can burn every second. Theoretically, several, large cylinders can also mean faster speed. This is also the reason why super-fast JDM and sports cars have at least eight cylinders instead of the conventional four or six cylinders. Aside from adding more cylinders, you can also use a turbocharger to make your car go faster. This component forces more air into the cylinder, allowing your engine to burn fuel at a faster rate. Turbochargers have two primary sections—the compressor and the turbine. Meanwhile, the turbine is made up of two components—the turbine housing and the turbine wheel. The housing guides the exhaust gas into the wheel. The turbine wheel starts to turn, using the energy coming from the exhaust gas. The gas then goes through an exhaust outlet area to exit the turbine housing. The compressor also has two components—the compressor housing and the compressor wheel. You have to remember that the function of the compressor is opposite to that of the turbine. A steel shaft forges the compressor to the turbine. The high-velocity spinning of the compressor wheel draws the air in. As the air gets compressed, the compressor housing converts it into a low-velocity, high-pressure air stream. The diffused air is then pushed into the engine, allowing it to burn more fuel and generate more power. So, do you think having a turbocharger is something suitable for your driving needs? Click on the button below to access the biggest JDM source, with over 140,000 cars listed weekly, find that JDM Car that you want and customize it! The post Everything You Need to Know About a Turbocharger appeared first on Carused.jp Blog. It is not always that you will have someone to help you when your car breaks down. You would not want to get The post The Ultimate Emergency Car Repair/Maintenance Guide You’ll Need appeared first on Carused.jp Blog. It is not always that you will have someone to help you when your car breaks down. You would not want to get stuck in the middle of nowhere only to realize that you do not have a spare tire or that you do not know any quick fix to the issue in your car. So, in this post, we are going to share some emergency car repair tips that you’ll need to ensure that you are prepared when the unexpected happens. What are the Emergency Tools to Keep in Your Car? Remember that you need to be able to change your flat tire on your own. So, you’ll need the tire jack and iron with you. Without them, then the spare tire will be useless. Moreover, if you always keep the special security key for the wheels in your car, if applicable. Keeping these two items in your vehicle can ensure that you will be able to plug any air leaks in your tires. Consequently, you can keep driving until you reach an auto shop. Dying batteries can happen even to the best of us. So, it is ideal to keep jumper cables in your trunk. You can also pack an emergency battery booster. This way, you won’t have to wait for another driver to come along before you can jump-start your battery. Of course, you should always keep your car’s manual inside your glove compartment. This booklet can help you identify and fix basic issues in your vehicle. It is ideal to address tire issues before they blow out. So, a tire pressure gauge is one of the tools to keep in your car at all times. Having one ensures that you will be able to fix under-inflated tires as soon as the symptoms start to show. You have to ensure that you are still visible at the side of the road when you pull over. Reflective triangles or flares can prevent you from getting hit by other vehicles. Check your owner’s manual to know the recommended engine oil levels. If you do not know where to find the dipstick, you can check the manual to get the information. Park your car on level ground and switch off the engine. Make sure that the engine is cooled down completely before proceeding to the next step. Open the hood of your car and locate the dipstick. Wipe off any oil from the end of the dipstick, then insert it into its tube, pushing it all the way back in. Pull the dipstick out, then check its sides to see where the oil’s end is. Consult your manual to know the recommended level. If the engine oil sits below the minimum mark, you need to add more fluid as described in your owner’s manual. The first thing you need to do is park your vehicle on level ground. Remember to put on the parking brake and the warning device. Place the wheel wedges, then detach the hubcap. Take your wrench to loosen the lug nuts, but do not remove them completely. Put the jack beneath the frame of your car. Use the jack to lift your car, then remove the loosened lug nuts. Keep the nuts in a safe location. Detach the flat tire, then mount the spare. Put back the lug nuts, then tighten them by hand. Lower your vehicle slightly until the new tire touches the ground. Note: Do not lower your car all the way. Take your wrench, then start tightening the nuts. Instead of tightening the nut that is adjacent to the first one you worked on, it is best that you move on to the one that sits opposite. Start lowering the car all the way, then re-tighten the lugs. Replace the hubcap, then check if the new tire needs air. Ensure that the two batteries have similar voltage. Otherwise, you might damage the electrical components once you jumpstart the car. Move the two vehicles close together, but prevent them from touching each other. Take the red clamp and connect it to the ‘dead’ battery’s positive (+) post. Take the other red clamp and connect it to the good battery’s positive (+) post. Take the black-end clamp and connect it to the good battery’s negative (-) post. Make sure that the other black-end clamp is connected to some large metallic part of the engine block of your car. Do not attach it to the ‘dead’ battery’s negative (-) post. Doing so will cause sparking that will ignite battery gases. Get the working car to run at idling speed for a couple of minutes. After that, try starting the ‘dead’ car. Once your ‘dead’ car is functioning, disconnect the jumper cables in reverse order. There you have it… some of the essential emergency car repair tips you’ll need in case your vehicle breaks down unexpectedly. Now that you know how to handle unprecedented situations like this, it is time for you to get your very own used car! Click the button below to start bidding on premium quality yet highly affordable pre-owned vehicles! The post The Ultimate Emergency Car Repair/Maintenance Guide You’ll Need appeared first on Carused.jp Blog. It is undeniable that Japanese automakers are quickly dominating the used car market. Because of the country’s free trade deal with the EU, The post The Carused.jp Advantage in Exporting Used Cars to Europe appeared first on Carused.jp Blog. The post The Carused.jp Advantage in Exporting Used Cars to Europe appeared first on Carused.jp Blog. The post Importing a Car to Europe? Here’s What You Need to Know About Homologation. appeared first on Carused.jp Blog. If you are the owner of Caruse Blog, or someone who enjoys this blog why not upgrade it to a Featured Listing or Permanent Listing?